Met up with Anthony from .citycycling last weekend. He was visiting Copenhagen with his one true love, Mel. We three had a few beers and a long, passionate chat about Copenhagenizing and promoting cycling positively. Anthony and Mel are from Edinburgh. The similarities between Scotland and Denmark are interesting. We've both got about 5 million people. We're roughly the same size [I'm not including Greenland here... don't want to make the Scots insecure...], we have basically the same crappy winter weather and a sub-standard football league dominated by two incredibly overrated clubs. The difference is that we have 18% of our citizens riding each day. Scotland is at about 1%. Denmark can be a real source of inspiration for Scotland because of the similarities. Anyway, have a look at this month's edition of .citycycling, which Anthony publishes online. 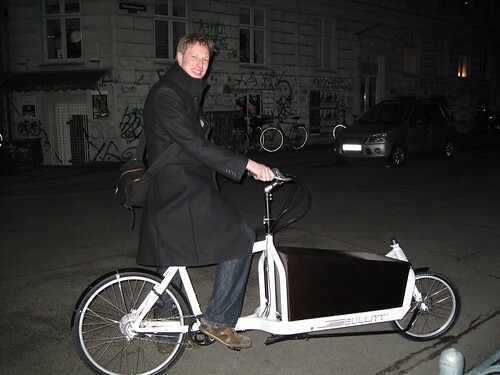 There is a great article called Copenhagen Cycle Chat. Last year me and Copenhagenize.com met up with over 100 visitors from all over the world here in Copenhagen. From Japan to Portland, from Melbourne to Chicago. More often than not, we went for a bike ride around the city to see the highlights of our bicycle culture. It's great to hook up with likeminded individuals. Let me know if you're coming and, if you know of a delegation heading my way, I'll take good care of them. A bike ride, a lecture about what we've done and where we going with our bicycle culture.